He’s gone by many names for the past 75 years. Ernesto, Ernest, Ernie, Ern, Angus. Whether he’s on a 10 day excursion into Baja or constructing his own retaining wall out of cinderblocks in his back yard, he has never stopped making a life for himself & his family that he loves. Here’s a man who can take a clunky, unpredictable arc welder he borrowed from a farmer in the middle of Baja California and fix his crippled trailer by welding scraps of metal, rusty wrenches and other detritus he found on the farm. 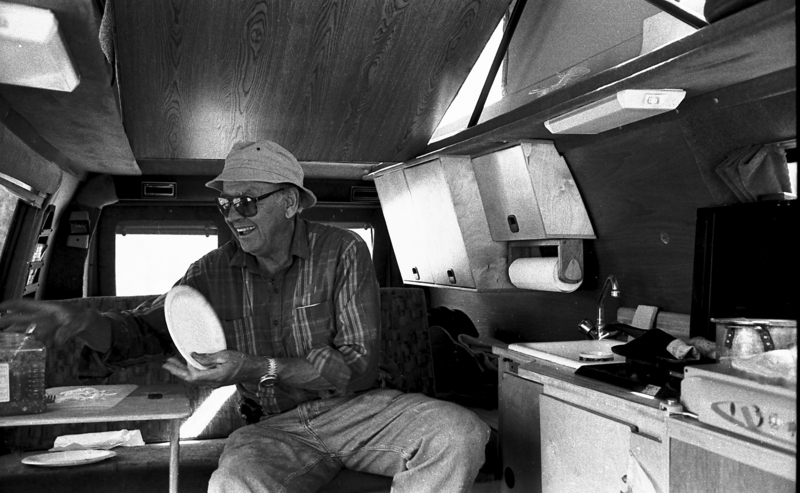 Then on another adventure, he used a tarp and some ingenuity to make a makeshift keel on his Zodiac after he hit some sharp rocks on the way down a class IV rapid on the Colorado river. He has instilled in me my sense of adventure & I love him for it; thanks Dad. The first time I met Ernesto was in the driveway of your house in SD. I pulled up in my flat black Pontiac Grand Prix with the broken mirror and faulty electrical system. Standard Kodak issue at the time. There was a VW van in the driveway, on blocks, and as I rounded the front quarter panel out came a huge man covered in grease with a wrench the size of small child. I almost squealed and ran, but figured if I fled the beast would surely run me down. I tried to put the brake housings and spare tire between us I planned to negotiate my surrender. He had a gleam in his eye, sizing me up. He looked like he could pick up the van, and it was clear that whatever he was doing was standard routine. Later that afternoon he asked if I wanted to see your darkroom, so we headed out back and down the hillside in the tunnel. When he mentioned the tunnel I had visions of some small enclosure. I had yet to learn to calibrate the Ernesto gauge. I entered the darkness and walked into a full on, full scale, movie set, Guns of Navarrone tunnel that I could not believe existed. He is still the only person I know who built a tunnel. I’ve never been to Baja with you guys, or Death Valley, but I figured it would be a trip of all trips. Pass along my howdy to he and the mother unit. Will do Dan. That was such a great story, That is so typical of Dad though, always working on something, always figuring some project out. So funny about the darkroom tunnel, that was built by slave labor, you know, lol. Both my parents are very fond of you, thanks for the great story, buddy.